When the Mexica people founded the city of Tenochtitlan in the fourteenth century, they built it on an island in the center of an inland lake in the fertile Valley of Mexico. Over seven centuries, the population of the city – now called Mexico City – grew to 2 million in the 1940s, before exploding to over 20 million people today in the city and surrounding metropolitan area. With the population explosion came an exploding demand for water which, since the nineteenth century has been drawn from wells tapping the aquifer beneath the ancient lake. Today, many families in Mexico City pay dearly for the water trucks haul from those wells to their neighborhoods. But the entire city pays for that water in another way, as its buildings shift, settle, and sink into the ground. The geology of subsidence caused by groundwater extraction is analogous to a house of cards. 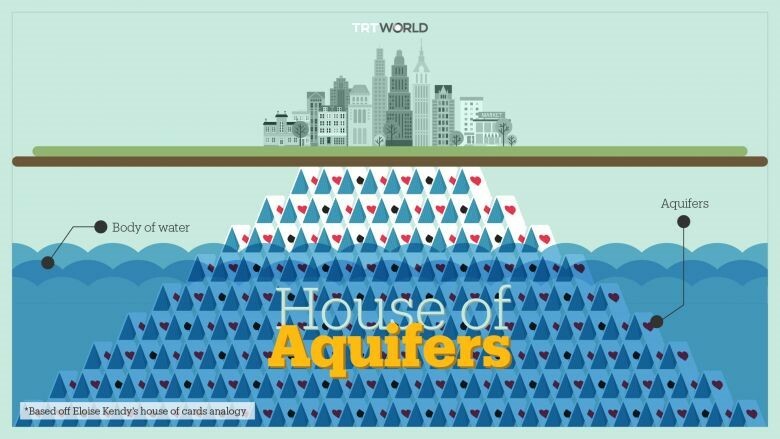 As this graphic from TRTWorld illustrates, when the ground is full of water, the spaces between the cards are full, the cards are supported, and the city stands on top. Groundwater extracted at a moderate pace is replaced by water filtering back into the aquifer, maintaining stability. 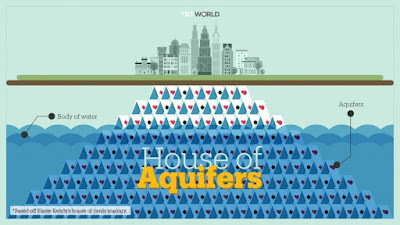 But when groundwater extraction increases to rates that lower the water level in the aquifer, the spaces between the cards are emptied, the cards collapse, and the city sinks. Mexico City is a prime example. 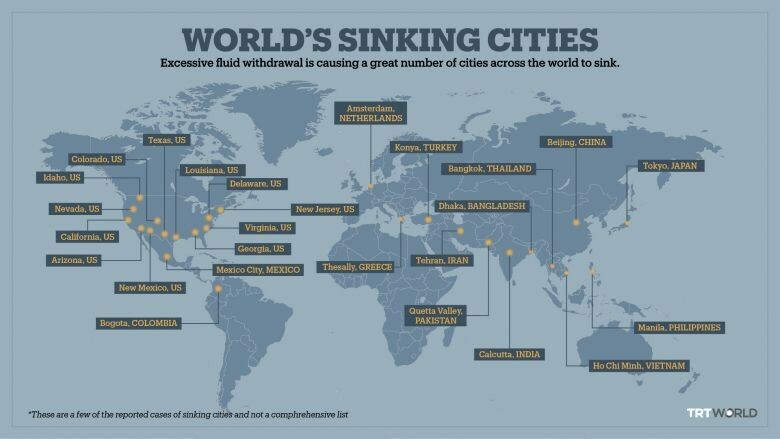 With thousands of wells sucking water from beneath it, most of the city sinks at a rate of a few centimeters per year. But some areas in Mexico City have sunk faster. The Mexico City Metropolitan Cathedral has tilted, underground sewers and water pipes havebroken, and the magnificent Palacio de Bellas Artes has sunk so far that its original ground floor is now the basement. The global-warming narrative of rising sea levels, and the threat to coastal cities and their millions of inhabitants, have become familiar. Also familiar is the fact that many of these same cities are sinking into the soft coastal soils they’re built on, creating a double threat. (New Orleans, for instance, was sinking at a rate of about an inch per year in 2006, and its levees were sinking even faster.) 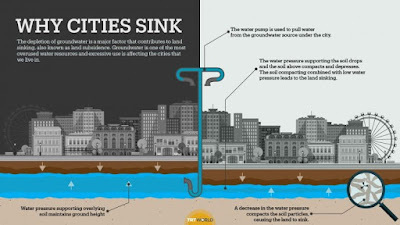 Less well known is the phenomenon of non-coastal cities subsiding as extraction of water from the aquifers beneath collapses the geology that supports them. This slow-motion catastrophe (which by geological standards is hurtling along at breakneck speed) threatens the stability of buildings and infrastructure on a sobering scale, and makes these non-coastal cities more vulnerable to the same natural disasters that threaten their coastal cousins. Mexico’s sprawling capital, which lies a mile and a half above sea level, is not alone. Wherever surface water is scarce, and groundwater is the primary source, subsidence tends to follow. Researchers at Arizona State University have reported that parts of Phoenix, which is more than 1,000 feet above sea level, are sinking due to groundwater extraction. They predict that, as the phenomenon progresses, fissures forming in the ground will threaten canals, utility lines, water mains, storm drains, sewers and building foundations. German geoscientists studying subsidence in Iran have noted that in Tehran, which is located almost 4,000 feet above sea level, subsidence has caused cracks in buildings, roads, and pipelines. Geotechnical studies have found that Bogota, Columbia, at 8,700 feet, is sinking about an inch per year due to extraction of groundwater. The phenomenon has been noted in many other non-coastal cities well above sea level – including Dehli, India; Sao Paulo, Brazil; Las Vegas; and Riyadh, Saudi Arabia – to name a few. Physical damage to buildings and infrastructure caused by subsidence and earth movement is typically excluded from coverage under first-party property insurance policies. However, insurers should be aware that subsidence can increase the risk of physical damage caused by other perils, and monitoring subsidence trends may be one way for insurers to gauge increasing exposure risks. For instance, scientists studying subsidence in Houston have found that groundwater extraction caused the soils beneath the 6,000-acre Meyerland neighborhood to sink about 18 inches during the 1980s and 90s, which is more than in the surrounding areas. The storm sewers designed to drain the area sunk as well, decreasing their capacity. As a result, heavy rains are more likely to pool in Meyerland, and less likely to drain away without causing flood damage. The appearance of the Meyerland basin shows that insurers who provide coverage for flood damage would be wise to monitor subsidence trends, even if their policies exclude coverage for physical damage caused by subsidence, because the presence of the excluded peril may indicate an increased risk of physical damage that could be caused by or result from a covered peril. Meyerland also provides an example of the complex causation analysis that could arise where subsidence, an excluded peril, arguably causes a covered peril to occur like flooding – which results in physical damage. Insurers who provide earthquake coverage should also keep tabs on subsidence trends as an indicator of potential exposure. The house-of-cards analogy above illustrates how soils saturated with groundwater are inherently more stable. Soils destabilized by groundwater extraction, on the other hand, are more likely to shift – and to shift more dramatically – when an earthquake strikes. That means that for a quake of a given magnitude, the resulting physical damage will likely be greater in areas where subsidence has occurred because subsidence is a manifestation of less stable subsurface geology. Thus, it may be possible to anticipate increases in earthquake-coverage risk exposures by monitoring subsidence caused by extraction of groundwater in earthquake-prone areas. Broad scientific agreement that groundwater extraction causes subsidence has led to broad agreement on another point: subsidence is here to stay. The only proven way to slow or stop it is to slow or stop groundwater extraction. But population growth in arid urban areas shows no signs of slowing, and demand for water will inevitably increase. As this cycle accelerates, insurers will face increasing – and increasingly uncertain – risks. Monitoring subsidence trends in both coastal and non-coastal urban areas could be highly useful in coping with the increased risk exposures presented by subsidence.